I don’t work on assessments for the increased pay – it isn’t. I don’t work on assessments for the interaction and banter – there isn’t really any. I don’t work on assessments to teach everything I know and can – it’s not training. I don’t work on assessments for an easy day out – it isn’t. I don’t work on assessments for shorter working hours – they’re not. I don’t work on assessments for egotistical reasons – there is nothing to show. I don’t like the weather on assessments – it always rains/hails/snows. So why do I work on them? Maybe to enjoy using a high level of skill and judgement… Maybe to try and get the absolute best out of people, so they have the greatest chance possible of success. I enjoy seeing people succeed and get reward from that. Balance ambition with reality in terms of your ability. Get a pro’s opinion and advice. Refresher? Get real life experience of the job you’re being assessed on. Write lists of things to help, and time lines to stick to and revise. Bad ropework, navigation and group management (decisions) can kill people. Be good at these things! Go scrambling. Your personal performance should be good enough to inspire and enthuse your group, and give confidence in tough times. Don’t refer to kids in a derogatory way… they are usually more able than adults. Release so much environmental chat that your assessor has to tell you to shut up because he’s bored. Regard your trainers, instructors and assessors… try and copy their ambience. Why don’t people seem to show up on my assessments prepared? I don’t know. Having a lack of experience and trying to rush through the system can be a result of increased pressure from one’s workplace/employer, maybe people try to compete with peers going through the system faster than them. Ambition is deemed fortuitous in our society, and we’re encouraged to aspire to greater things… this may lead people to hastily book onto exams. A lack of real experience is going to be par for the course. By definition, most assessees in a chosen field won’t have real experience behind them, as they’re not qualified to gain it. I implore that if you are training towards an exam, you do everything in your power to gain experience as close to the real thing as possible. When I was going through various NGB awards, I set out to cover all possible bases that would help me achieve it. I am still going through this process at the moment. One thing that rang true for me was the British cycling team talking about marginal gains. When considering buying a new map before my MIA, I thought “The old map is only 3 years previous to this one, but, that tiny bit of extra detail or accuracy on the new map IS NOT going to make me worse, it is not going to make life more difficult.” So as small as the gain may have been, it helped. Write a timeline, like a training gym plan, of when to do things, tick it off as you go along. This can help realise the small things to have in place… such as a flawlessly well presented logbook. Then you’ll know if you’re ready. Real life experience is therefore slightly excusable on an exam, and I as an assessor will account for this. But rope work for instance can be practised for hours at home on a staircase with a weighted rucksac, whilst watching X-factor if you wish. It should be absolutely slick on assessment, so slick that even if the candidate has a complete brain-fart in panic and nervousness, with the most dreaded of assessors, they can still run through it with their eyes closed. Navigation must be to the same level! I don’t think the standard for ML navigation is unachievable high for 90% of the population, it’s fairly basic, but must be accurate. When going out getting the 40 odd days required for a logbook, set up on 5-10 minute legs to practise navigation. Don’t walk for an hour then get the map out for a token check… that’s not setting yourself up for success. 1:25k and 1:50k. get someone or a GPS to check and give feedback, it’s hard to learn and improve at anything without good feedback. 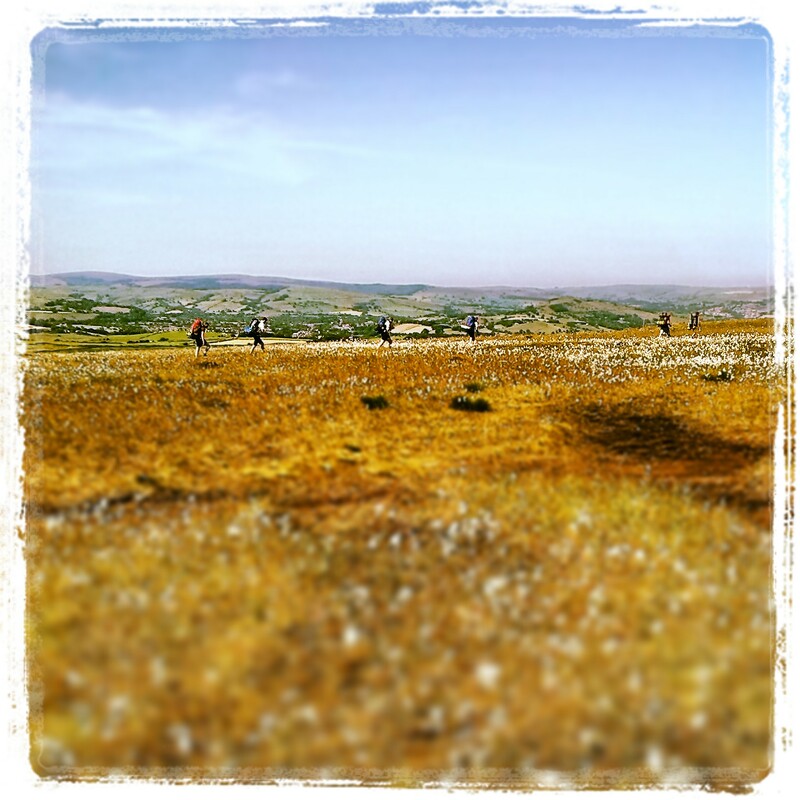 Please get some decent scrambling in before training, and definitely before assessment. If you gather experience before training, you will have a point of reference with the instructor on your training course, you’ll know what he’s talking about. After training is possibly too late. Buy the book. 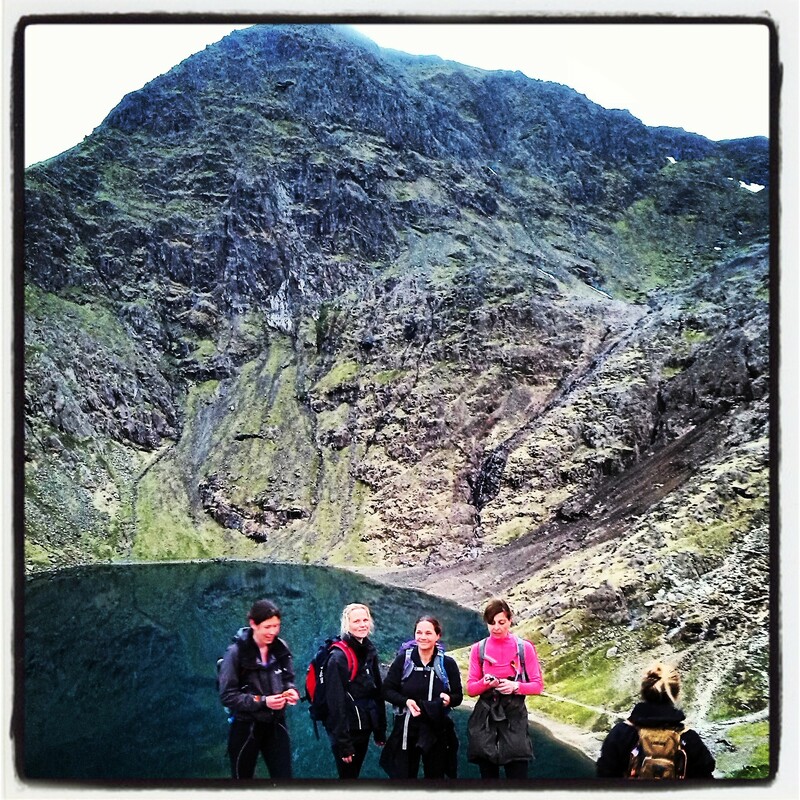 There are scrambling guides and ridge walk guides to the Lakes and Snowdonia. They will help to gain an idea of what the remit of an ML is. What is too hard for Grade 1, what is definitely easy enough to take a group of people up. No heroes, and no cop-outs. A good understanding of the grey area of middle ground is what you need to be a good mountain leader. This is the hardest part of the syllabus. JUDGEMENT. It’s also the hardest part for me to assess, because just about everyone messes up at some point. Admit it, talk it through with the assessor, go back on decisions if they’re wrong… back yourself. Don’t think that kids groups are the least able and require the most looking after and cautious route choices in the steep rocky ground. In my experience the kids with borrowed leaking kit can be far far more able than a bunch of middle aged office-bods wearing patagonia kit, some of whom may have been guided up 6000m peaks. Flora/Fauna/Geology/Glaciology/Folklore/Local Language/Place names/History/Architecture/Fungi/etc. a candidate should be able to talk about this stuff for hours. A lot comes with experience and learning from others. I’ve walked with a few geologists and been out on AMI CPD courses to increase this knowledge. But a Collins guide or Mike Reine’s book is sufficient to start out and get through an assessment. If you don’t tell me stuff, I’ll start asking what this fern is and what that rock is … likely result, you’re not going to know. I think there must be a fundamental flaw in UK NGB systems… or maybe Brits just think the assessment is going to be easy. Maybe people are too busy earning a living to train and practise. Maybe they watch too much television and drink too much alcohol. I don’t know the solution. But my patience probably has about another 5 years before it wears out, teaching, training, helping, assisting, facilitating success, etc of people who clearly haven’t prepared well enough. Well, I don’t think the benefits of assessing outweigh the frustrations of that. I come from a rugby playing background. I love team sports, but couldn’t take football. The thing I learned playing rugby, is to take ownership of yourself. If you don’t pass an exam, and get deferred, please take this on board yourself and ask questions of yourself not the assessor or training body. Placing blame on other people will not help you progress. It’s like shouting and swearing at a referee. You yourself haven’t met the grade, which is not the end of the world (see definition of deferral at top of page), and trust me, the assessor will have done everything in their power to try and give you the opportunity to pass. I don’t like deferring or failing people. Lots of very little flowers all the way up the stalks. Long stalk, small pale green leaves, flowers at the top. 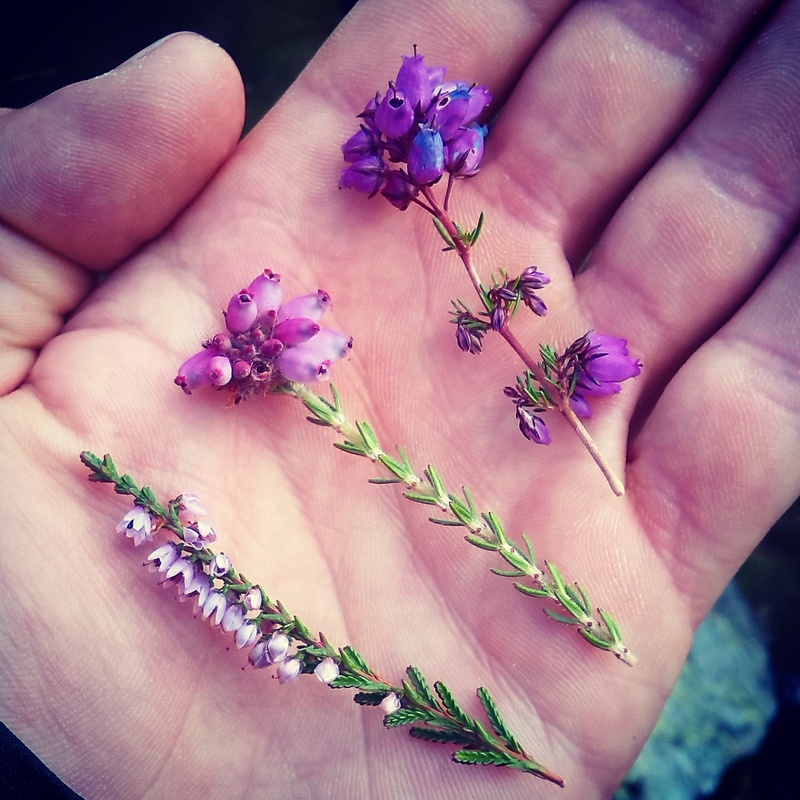 Darker green leaves, darker purple flowers, flowers in bundles along the length of the stalks. A few weeks ago I was contacted by a company that run Mont Blanc trips out of Chamonix. They generally run a 7 day alpine climbing introduction, which ends in the summiting of Mont Blanc. One of their potential clients was unsure whether he was fit enough and skilled enough to make the most of the trip in late August or whether to wait a year and put some more time in. I agreed to take him out and assess his skills and fitness against that required to climb a 4000m European peak, on the basis and experience I have from this Alpine Climbing Course. So we met 8.45 in the Siabod Cafe for a quick panad, before embarking on the day. Starting from Gwern Gof ….. (the one below Tryfan) … we smashed it up to the Heather Terrace on the East Face in about 45 minutes. Geoff keen to show his fitness, and me keen not to lag behind! But it showed it’s toll when Geoff ran out of water before we started the first scramble…! Nor Nor Buttress variant. I led each pitch with a focus on fast movement and efficiency rather than education of the rope systems I was using. With a 50m rope, I body coiled all but about 12m, and made short fast pitches mixed with short roping the less serious sections. We reached the top junction with the North Ridge at about 11 am. 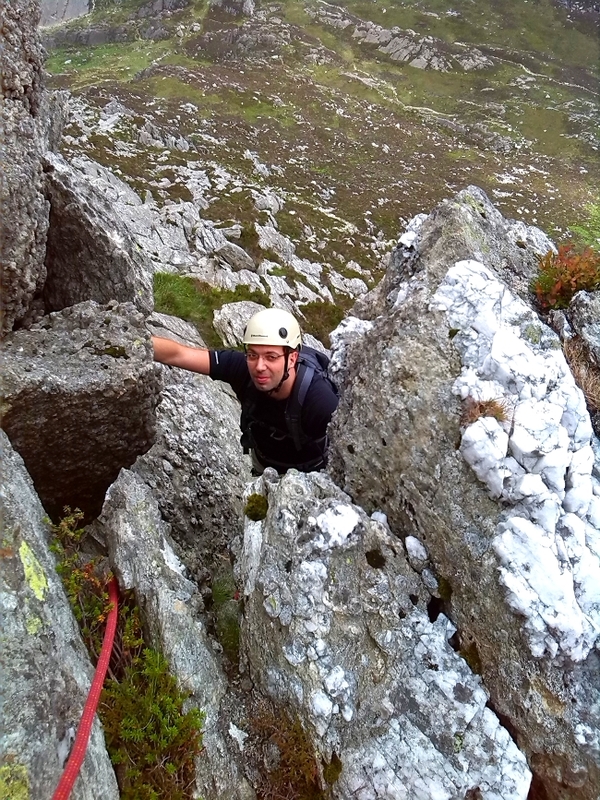 Went over Tryfan summit, then to the south summit, and down along to the start of Bristly Ridge. I wanted to find the most challenging route up the ridge, so stayed true to the line straight up and found some very challenging steps. More than grade 1 for sure. 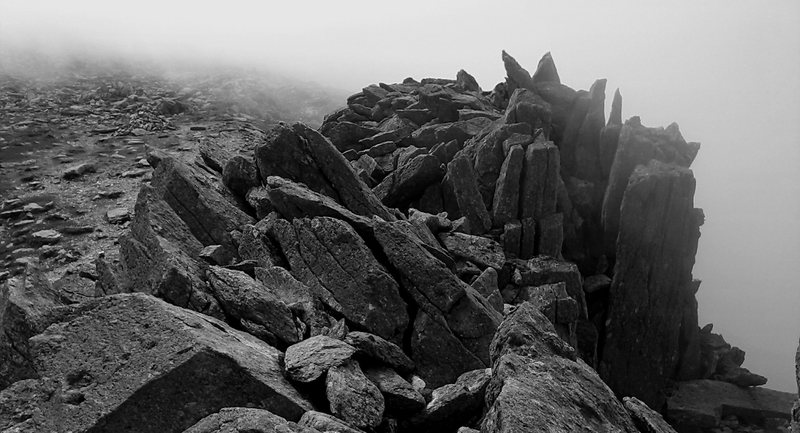 We topped out from the ridge as the clouds were rolling up and over the plateau of Glyder Fach. It was like arriving at a 1970’s film set of the Moon landing with a trigger happy dry ice operator. We then headed with very little visibility over the top of Glyder Fawr, which is a shame because the views of the Carneddau and Snowdon hills are utterly stunning. 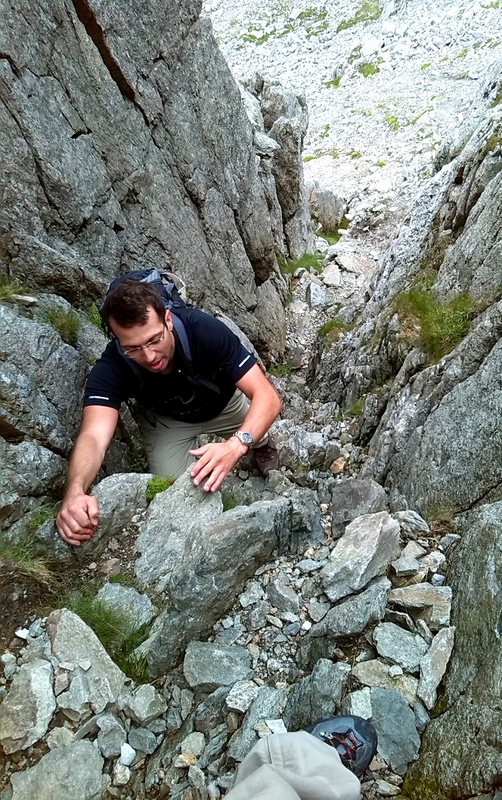 Down the horror show scree slope towards Y Garn, then into Cwm Idwal. We hit the Idwal cafe for an ice cream at about 4.30pm, a lot of terrain covered and the aim of the course (a bit of rope work and generally walking a long way over mountains fast) was accomplished.